How fabulous is this room? Designed by one of my favorite designers, Jonathan Adler, this room screams glamour chic, don't you think? 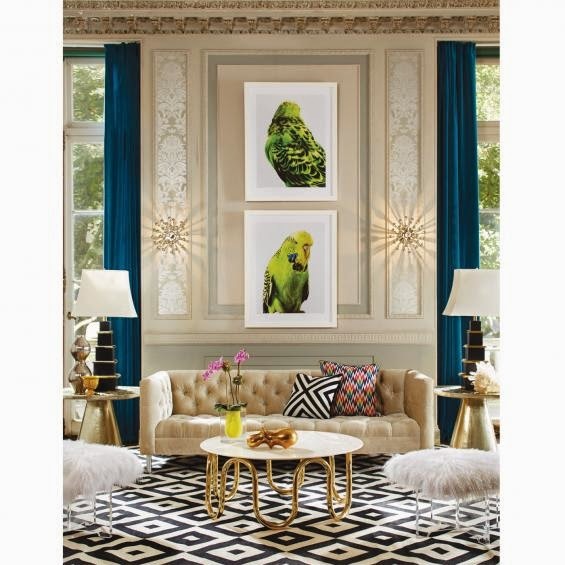 I am swooning over every element in this space which includes the classy coffee table, the beautiful wall sconces, the vibrant parrot artwork, the gorgeous velvet curtains, those stylish lucite stools and the bold geometric rug. I love seeing rooms that are thoughtfully pulled together in a fun, unexpected way and this is definitely one of those rooms! Are you in love with this room as much as I do?